Sources: U.S. Energy Information Administration, based on the Electricity Reliability Council of Texas Annual Capacity, Demand, and Resource Reports and 2012 Long-Term Demand and Energy Forecast. Notes: Target reserve margins are set by the working groups of the North American Electricity Reliability Corporation. Realized reserve margins are calculated by dividing the difference between capacity and peak demand by peak demand. Forecasted reserve margins are calculated by dividing the difference between forecasted capacity and forecasted demand by the forecasted demand. Because forecasted reserve margins involve forecasted data, there is inherent uncertainty in this statistic. 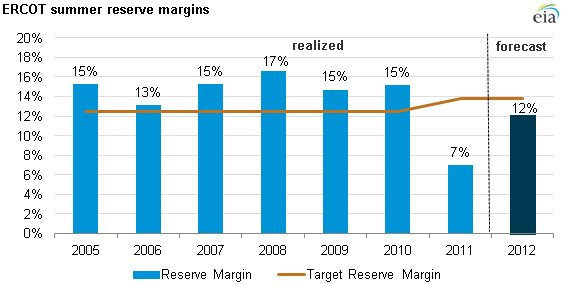 Reserve margins serve as an indicator of supply adequacy in an electric system. In 2011, due to a combination of the hottest summer on record and some unplanned outages, the Electricity Reliability Council of Texas (ERCOT), the system operator for most of Texas, fell below its target reserve margin. Based on forecasts of supply and demand, this system is also not expected to meet its 2012 target. Increasing electricity demand in Texas presents a series of operational challenges to ERCOT. Expected peak demand for 2012 is about 2 gigawatts less than the record-breaking levels seen last August, but summer capacity levels have declined slightly since last summer. The ERCOT system had an anticipated reserve margin of 13.51%, a level below the reference margin level of 13.75%, according to the NERC study. Calculating the reserve margin based on ERCOT's latest forecasted demand and capacity yields a reserve margin of 12.11% (see chart). The lack of new capacity within ERCOT is compounded by the fact that ERCOT has limited interconnections with the adjacent power grids, reducing its ability to obtain additional help when a supply shortage arises. Because of a severe, prolonged heat wave ERCOT broke its peak demand record on 15 days in August 2011. Day-ahead, hourly wholesale electricity prices peaked above $2,500 per megawatt hour (MWh) several times last August, a sign of system stress due to the supply shortage. So far in 2012, wholesale electricity prices have remained low as a result of the decline in natural gas prices; although a brief temperature increase in late April drove hourly, day-ahead wholesale prices above $500/MWh. Increasing the system-wide offer cap (the maximum allowable bids for electricity into the market) from $3,000 to $4,500 beginning August 1, as an incentive to market participants to build more electric generating capacity. Expanding a program that allows large electricity consumers with their own source of on-site generation (such as hospitals) to allow temporary disruptions of their service in order to reduce demand. The program is called the Emergency Interruptible Load Service. Making other changes to pricing and deployment of emergency standby units (called non-spinning reserves). In addition, generators in ERCOT have decided to bring back into service 1,984 megawatts of previously mothballed electric generating capacity including a 138-megawatt petroleum coke plant, 1,608 megawatts of natural gas steam units, a 225-megawatt natural gas combined-cycle plant, and a single natural gas combustion turbine unit with 13 megawatts.